When California became a state in 1850, Santa Cruz was one of the state’s original counties, and it was at the mouth of the city’s San Lorenzo River where in 1885, three Hawaiian island princes first introduced surfing to the mainland. On the northern edge of Monterey Bay, about 75 miles south of San Francisco, Santa Cruz is a mix of outdoor playground, college town (home to University of California Santa Cruz), and hippy and hipster haven. It’s got a mellow climate and world-class waves. Looking out over the water, along with surfers and paddle boarders, you may be able to spot sea otters, brown pelicans, harbor seals, sea lions humpback whales—which feed in the bay often from late April to early December—and gray whales, which migrate along the coast between December and April. 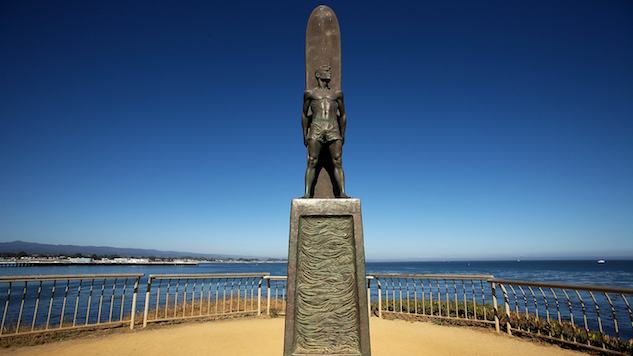 It fought with Huntington Beach, California in court over the official moniker “Surf City USA.” And although Huntington Beach has the rights to the name, Santa Cruz is home to Jack O’Neill, the surfing legend credited with inventing the wetsuit. Along with its surf, it’s a place for social activism, spiritual freedom with a heavy dose of New Age, and a downtown filled with street performers (and admittedly, panhandlers). Stop by The Picnic Basket, across Beach Street from the beach volleyball courts, for coffee and breakfast. They pride themselves on using local farmers and foragers to collect their seasonal menu ingredients, and they serve Verve drip coffee, one of Santa Cruz’s most well-known roasteries. From there, it’s a two-minute walk to the wharf that stretches into the Monterey Bay National Marine Sanctuary. The Santa Cruz Wharf at 2,745 feet is the longest on the West Coast. When maritime traffic was diverted in the 1960s to the newly built harbor, it lost its popularity, but more recently, it’s been redesigned as a tourist destination with shops and restaurants. Keep your ears open for the bark of sea lions—they like to congregate near the wharf to haul out and warm up. Morning is a good time to get out on the water for a kayak tour as the winds are usually calmer. Venture Quest Kayaking rents kayaks, holds classes and gives tours, and they launch right from the wharf. Back on land, learn about life beneath the waves at the Sanctuary Exploration Center. Across the street from the wharf, the free center has interactive exhibits and a small gift shop. For lunch, you can get seafood at Splash, the wharf’s latest restaurant. Every seat in the bright, eclectic space has a view of the bay, including a changing one at the rotating bar. From the wharf, it’s a 5-10 minute walk to the famous Beach Boardwalk, opened in 1907. Home to two National Historic Landmarks—the 1924 Giant Dipper wooden roller coaster and the 1911 Looff Carousel—it’s also got mini golf, laser tag and arcade games. Rides are open in the offseason on the weekends from noon to 5 p.m. and during the summer from 10 a.m. to 11 p.m.
From the Boardwalk, it’s just under a mile to downtown. Before the 1989 Loma Prieta earthquake, downtown was empty after 6 p.m., but after being hit hard by the 7.1 quake, the neighborhood was intentionally rebuilt to stay lively day and night. Next to people watching from a cafe, one of the best things to do downtown is shop for everything from organic baby clothes to flip flops to high-end home goods and collectibles. Artisans Gallery has art and jewelry by independent artists and Logos Books & Records is two stories of used and collectible music and books. For a casual (and delicious) dinner of burger and fries, Betty’s Burgers on Pacific Avenue is a local favorite. For a fancier (and pricier) dinner, Assembly, a relatively new addition to downtown, has an outdoor patio and serves farm-to-table seasonal dishes, like kale salad and wild mushroom risotto. If you have a sweet tooth, you’re in luck as there are plenty of dessert options on this strip. There are cupcakes at Buttercup Cakes, chocolate covered bacon at Marini’s, truffles at Chocolate and small batch ice cream with flavors like blueberry black licorice and pluot (plum + apricot) sorbet at Penny Ice Creamery. Downtown has plenty of nightlife options. For a beer or cider, there’s the cozy and slightly hipster Lúpulo Craft Beer House or for a cocktail, head to 515 Kitchen & Cocktails. You can also take in a movie at the Art Deco style Del Mar Theater. The Catalyst is a live music institution, and upstairs, you get the full dive bar experience with jukebox, pool tables and arcade games.